Happy New Year everyone. I hope you have all had a lovely Christmas and are enjoying the holidays. We are having an at home holiday this year and trying to get some jobs finished around the house. My lovely hubby has already finished painting the front of our house and is now on to building a bedroom for our eldest. He is sooo handy to have around. I can't wait for the boys to all have their own room. It will make such a difference...some time-out from each other is very important some days lol. Only problem is that I have to do some major downsizing of my scrapbook supplies so I can fit in my new area. Sam (my now 14 month old) loves to help and as I try and organise he is busily unpacking everything in sight. Sigh. I will get there one day. 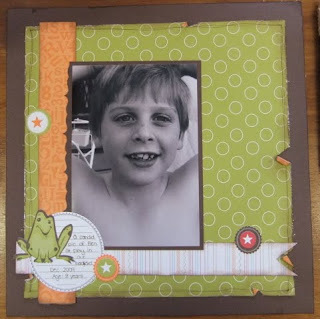 I have managed to do a little scrapbooking though and I have a page to share using the Hoppy Memories Scrapbooking Kit from Stampin' Up!. There is lots of inking and distressing on this one and I have used the Curly Label punch to make a border on my photo mat.